Active Energies Solar is proud to announce that we’re now installing in Grand County. giving away a FREE 3.1kW PV roof mounted system, valued at $9,000. To be eligible, homeowners must schedule an on-site consultation, and receive a complimentary, customized solar proposal. If a customer decides to purchase a solar system before the drawing, they will receive an upfront $1000 system discount. They will still be eligible for the drawing, and would be reimbursed $8000 (in addition to the upfront $1000 discount for a total of $9000 savings) if they win the drawing. To enter call (970) 306-4233 and schedule your free on-site consultation today. Active Energies Solar will be throwing a party from 1-4pm on August 26 at the Roadhouse Bar and Grill in Grand Lake to announce the winner of the solar system. You do not need to be present to win. * The free system will be a 3.1 kW roof mounted solar photovoltaic system, complete with panels, racking, inverter and installation ($9,000 value). Owner may purchase a larger system with the cost of the 3.1kW system deducted from the cost of the larger system. * Properties must receive an on-site analysis, and customized, complimentary solar proposal by August 20, 2018 to be eligible. * The property must be located within Grand County, Colorado and receive electrical service from Mountain Parks Electric, no off-grid projects. * Only existing homes are eligible to participate, no new construction. * The person receiving the proposal must own and have control over the property’s roof (i.e. no condominiums). * Individuals must contact Active Energies Solar and schedule an in-person onsite consultation (takes 45-90 mins and is free of charge) to discuss the solar options for that residence. * Individuals who have received a solar site analysis from Active Energies Solar in the past are eligible to participate but are not entered automatically. Individuals must contact Active Energies Solar to express interest in being entered to win. 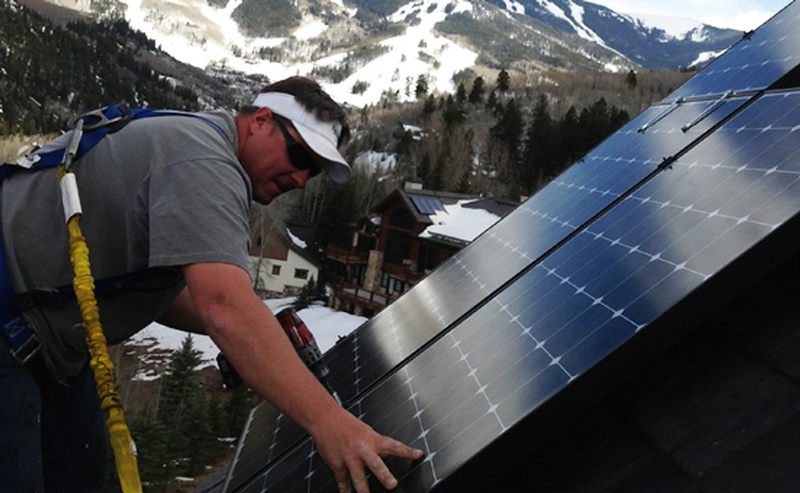 * Any solar rebate from Mountain Parks Electric will be assigned to Active Energies Solar. * Federal tax rebate will not be redeemable to the home owner unless a system over 3.1kW is purchased, owner will only receive rebate based on the actual amount paid by owner to Active Energies Solar. Please consult your tax adviser - Active Energies Solar is not licensed to provide tax advice. * Winners are not eligible for any alternative prize or cash value in lieu of the solar installation. * Limit one entry per home. * Installation is contingent upon structural, electrical, permitting and interconnection requirements. Active Energies Solar will not be responsible for any alterations to make the property meet minimum requirements. * At Active Energies Solar's sole discretion, a property may be deemed ineligible based on structural, electrical, limited production from excess shading, and/or interconnection concerns. * The winner will be drawn randomly at the Active Energies Solar end of the summer party. The winner need not be present to win.